sisu: Because of, not in spite of, stupid! Some surprises in numbers on the President's electability today. Significantly more Americans say they trust Bush more than Kerry to handle the situation in Iraq. We disagree with the premise of the headline. DESPITE Iraq and the 9/11 hearings? How about BECAUSE of Iraq and the 9/11 hearings? We loved reader Pam of pamibe's comment: "Because of, not in spite of! Sounds like a new war cry. ;)"
*A better picture than the one posted here earlier . . . We found it on pamibe, natch. Good post. I was thinking the same thing when I read "DESPITE Iraq and the 911 hearings" I took a double take when I read that headline on (Fox or Drudge, I cannot remember). Most people voting for Bush are doing it "in spite of", however. And most people aren't voting for him. This view represents the minority of the minority. It depends upon what your definition of "most" is. Do you have figures to back up your claim? Hmmmm. I wonder Paul thinks now of the 64-million "minority of the minority". My vote was because of. Kerry's voters were in spite of. I didn't vote for either one of those reasons. I voted for Bush because he's not afraid to stand up for what he believes. He does what he knows or believes to be right even if it will cost him votes. He doesn't "flip-flop" in order to keep up with popular opinion. 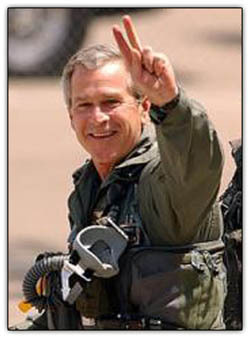 President Bush has saved this country form an all out assault from middle east radical factions. Kerry would most likely have Jane Fonda as sec. of defence. Do what you have to do president Bush to protect our people. The 911 is all a Bush conspiracy, haven't you heard? Look at the oil price now and you might have an idea why. Bush's incompetence has given Evil a bad name.